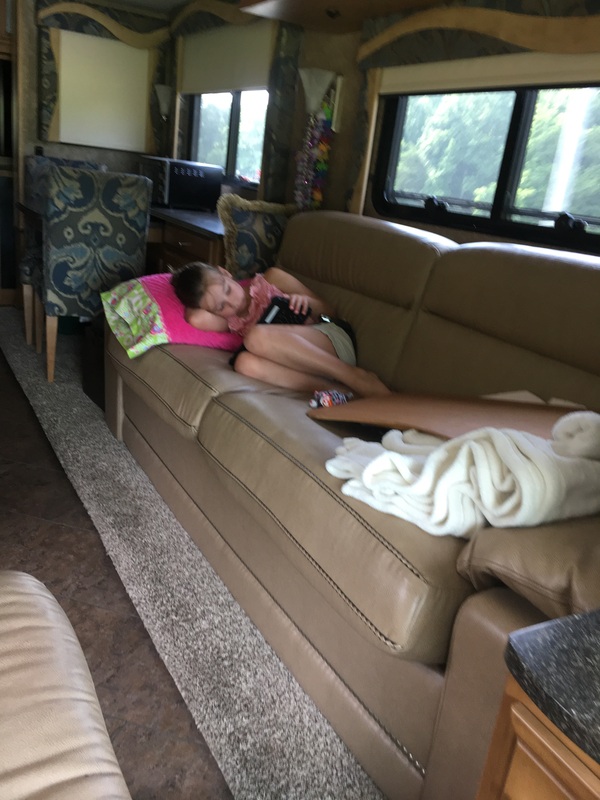 Rossville Ga – Let's Go RVing! Riding along on this pretty June day brings to mind that wonderful poem “what is so rare as a day in June” and it is certainly true today. After a good night’s rest Jerry and I were up fairly early but still had time for our “quiet time” and coffee, showers and then preparation for leaving. Jane brought Emma by on her way to school and we were nearly ready to go by then. Jerry pulled the coach up to the parking area and I followed in the car. Then we again hooked the car up to the motor home. Jerry does the outside work of hooking up and I do the inside “work” of putting the Jeep in the right gear to be towed. By 8:23 we were on the road to Chattanooga. It is a really pretty drive as everything is green and mountains are in the distance. It’s probably going to be a hot day but we’re cool inside so we are still enjoying the benefits of that rare June day. After a couple of hours we stopped at a rest stop mainly just to walk around for a few minutes plus take advantage of the facilities. Back on the road by 10:20 and Emma has asked how many more hours. Um… After a week-end of dancing Emma was pretty tired so she took a couple of naps on the way. That makes for a much “shorter” trip”! Of course, an iPad and a movie help too! FYI – she is belted in! 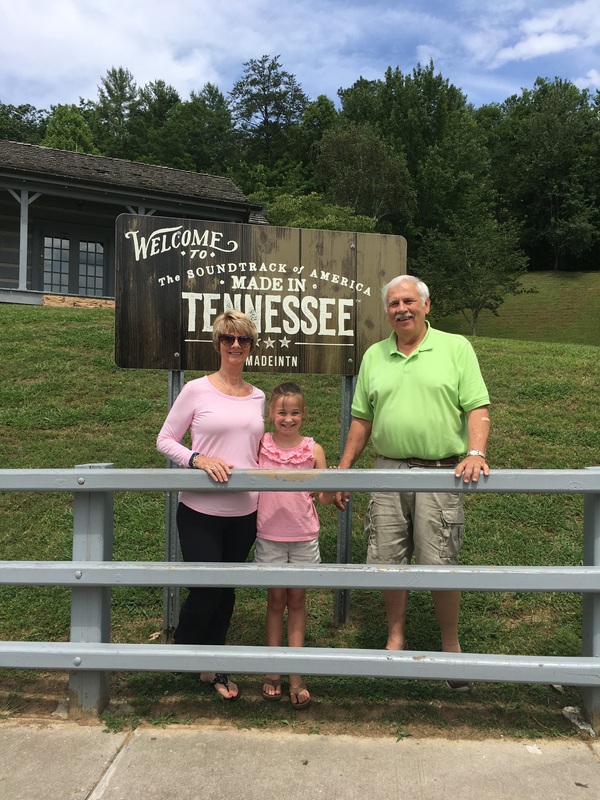 At the Tennessee state line we stopped at the Welcome Center to take some pictures and get some information plus we had lunch. We had originally planned to use the picnic area but decided inside with the generator and air condition was a better choice! It’s hot in Tennessee! We arrived at Holiday Travel Park of Chattanooga which is actually located in Rossville, Ga around 3:30 and had an easy check-in. We’ve stayed at this park on our Tennessee trip a couple of years ago and they have made improvements since then. The roads and the sites are graveled so we didn’t have to contend with mud if it rained. Also, the sites seemed to be further apart. They have a nice pool also. The only negative is its proximity to the drag strip. On Friday and Saturday nights the loud motors of the race cars can be heard but by the time they started we had ended our day and were inside so they didn’t bother us too much. We had a nice quiet spot almost at the end of the park, a pull-through although we needed to unhook before we pulled in in order to align the tanks with the pedestals. A quick set up and we had the rest of the afternoon. Jerry surely didn’t want to drive anywhere so Emma and I went discovering. 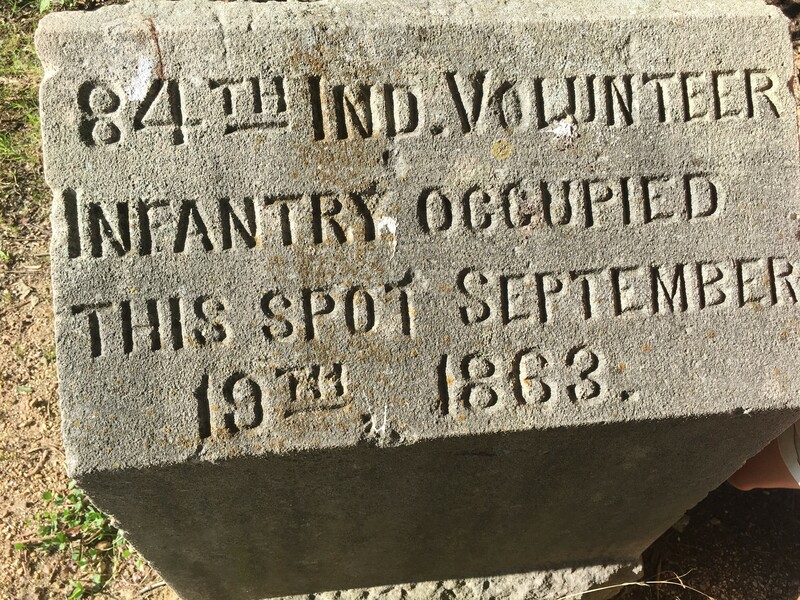 Since we knew that the campground was located on a Civil War battlefield which served as a skirmish site in 1863 preceding the Battle of Chickamauga we set out through the woods to find the marker denoting this information. We thought we were going on a long hike – nope, just a little walk and there was the plaque! We then decided we needed to go to the grocery store so the three of us headed out with no idea of where we were going. After several missed turns and finding a not so good grocery store we realized that there was a Publix fairly close by. Emma and I got the silly giggles and then she wanted a picture not only of the Publix sign but one of her standing beneath the store sign. All the way to Chattanooga to get a picture of Publix grocery store! As we walked in the first thing we saw was a watermelon – heck, our shopping was done! I’m quite sure people looked at us as though we were crazy (Jerry surely did) but we were having fun and since we didn’t know anyone we could act as silly as we wanted to – and we did! Back to the campground via a much closer route and then a nice dinner. Jerry had promised a treat after dinner so off we went again, to the local ice cream shop. A nice cone of chocolate ice cream is a good way to end a day!